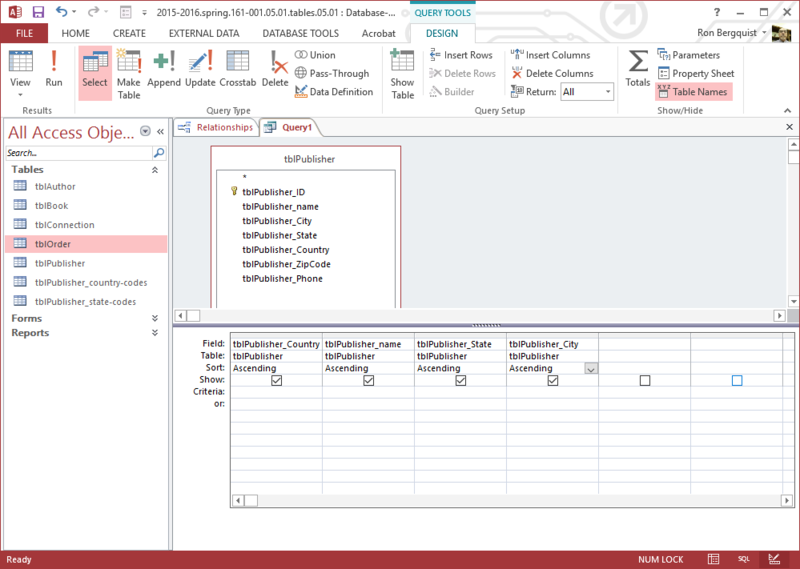 Queries ask questions of the tables and respond with dynamic new data in new tables. 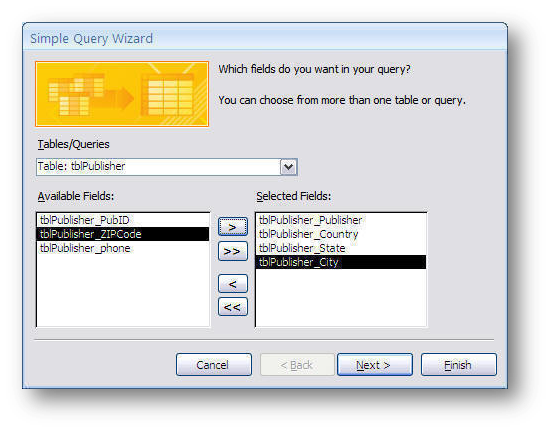 Access uses the Structured Query Language to create queries, though you won't necessarily have to directly write a query in SQL syntax. 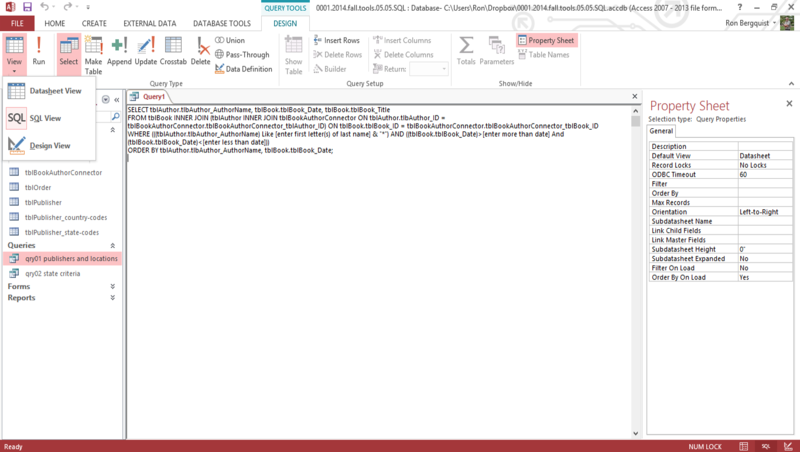 Microsoft's "Get answers from your data"
A query is a request of the database, the result of which is a new table. 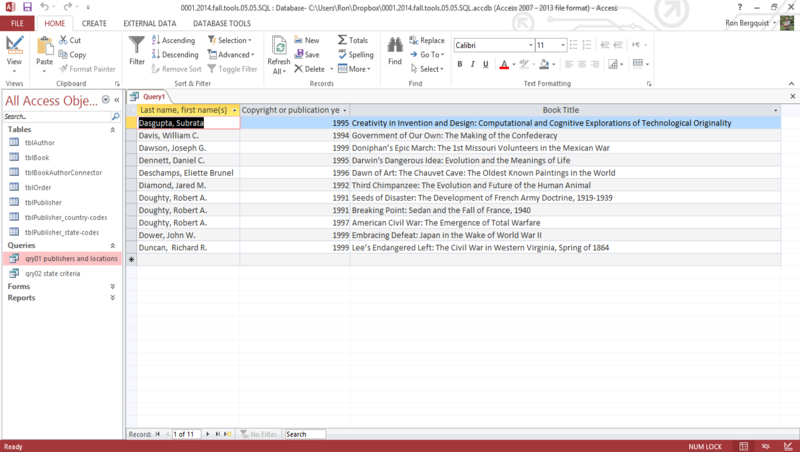 You can browse through the recordset, select from it, sort it, and print it. 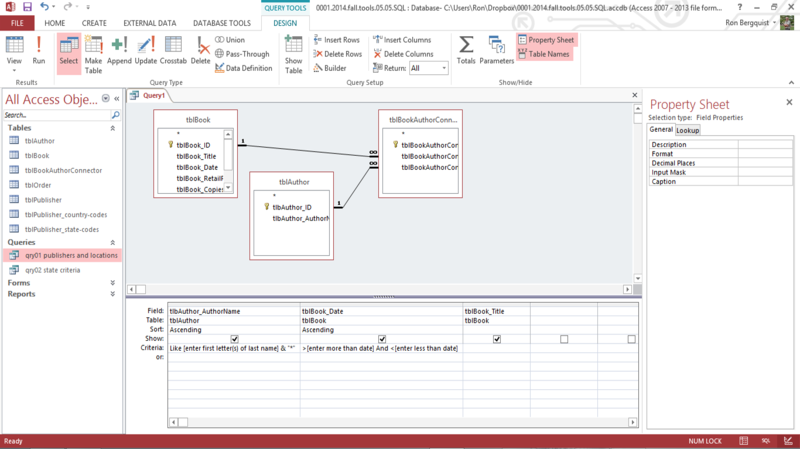 Typically, the recordset you produce with a query isn't saved, but the query structure and criteria you used to get the results are saved. read the question out loud and pull the elements of the question into the query design. Parameter Query: a select query that allows the user to specify selected parameters at the time of each query. 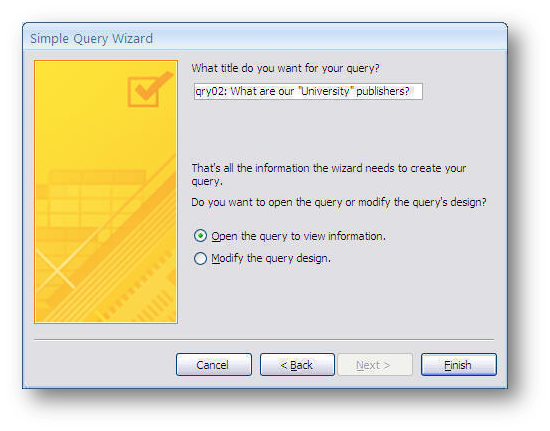 All the Queries we will do in the Access assignment will be Select and/or Parameter Queries. 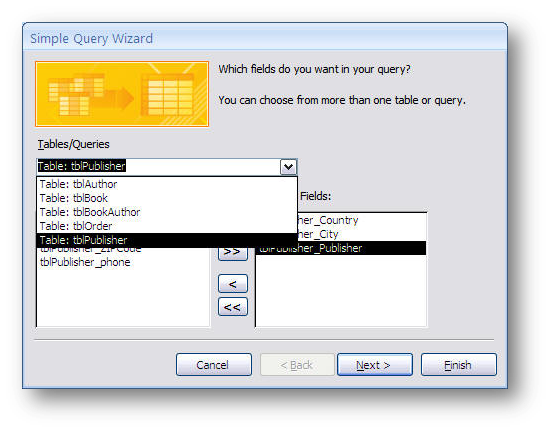 The Wizard can do simple queries by asking you questions and creating a query based on your answers. 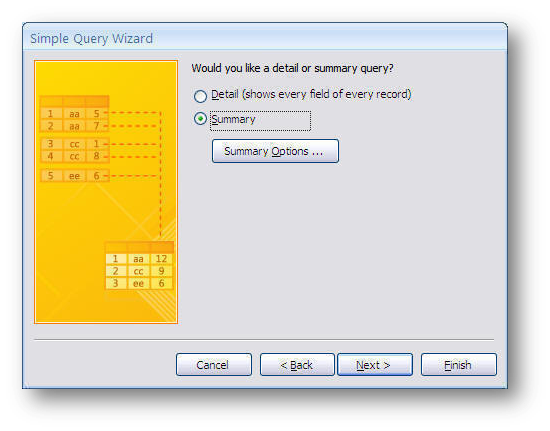 A select query retrieves data from one or more tables and displays the recordset in a datasheet. 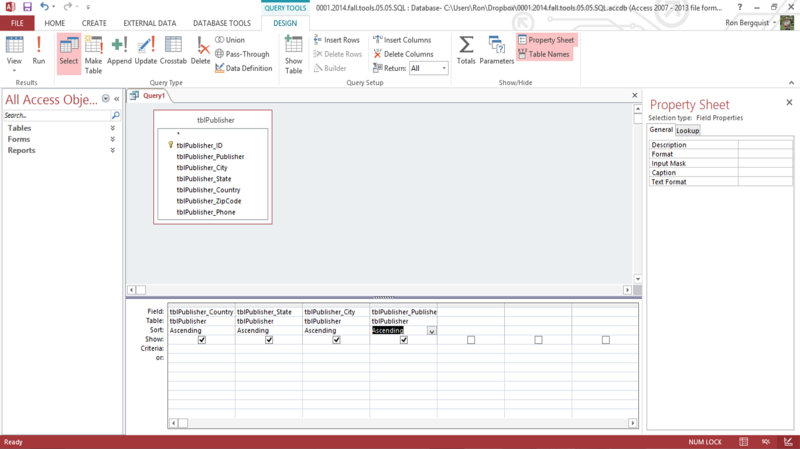 You can also use a select query to group data, and to calculate sums, counts, averages, and other types of totals, which we will cover in a subsequent session. If the fields selected include a number field, you have a decision to make. If you want to see each record, choose Detail. 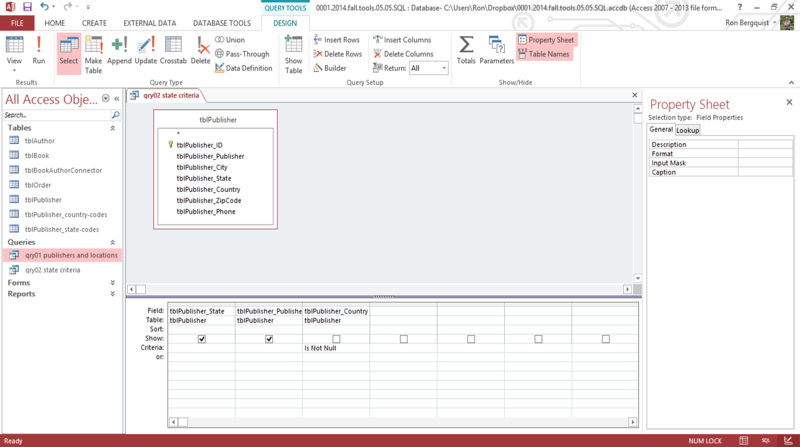 If you want to see totals, averages, or other summaries, choose Summary and set the summation options. 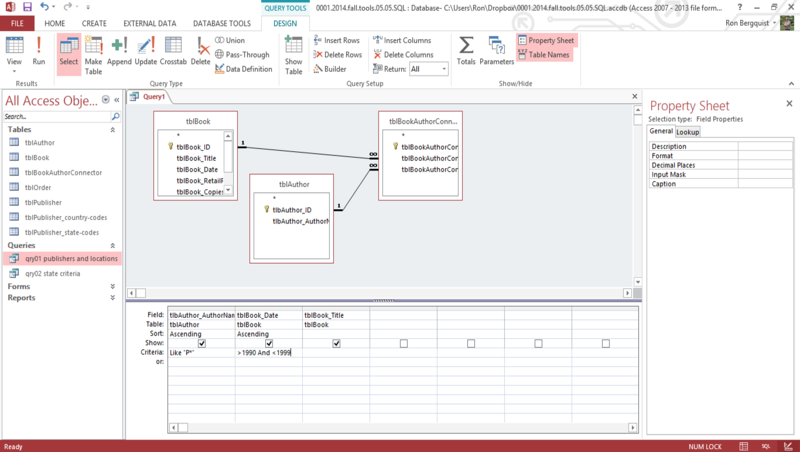 Other select queries allow you to add Boolean "and" and "or" criteria to the query and to sort the response. 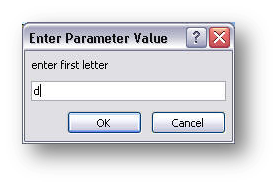 A parameter query displays a dialog box when it runs, prompting the user to enter information to use as criteria for the query. 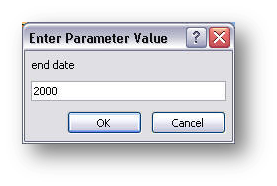 You can design a parameter query to prompt for more than one piece of information. For example, you can design it to prompt for something from one table as well as from another. 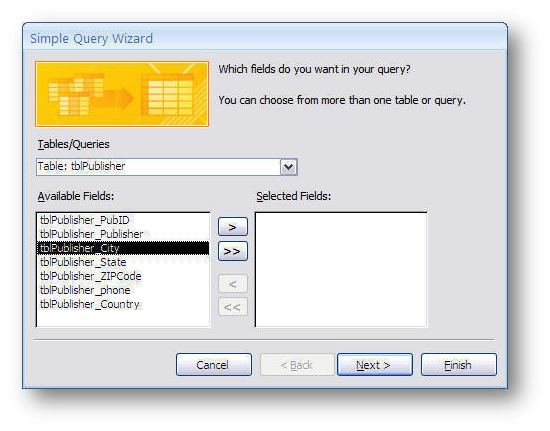 A parameter query allows you to design a query to return data in accordance with specific criteria you enter as you run the query. 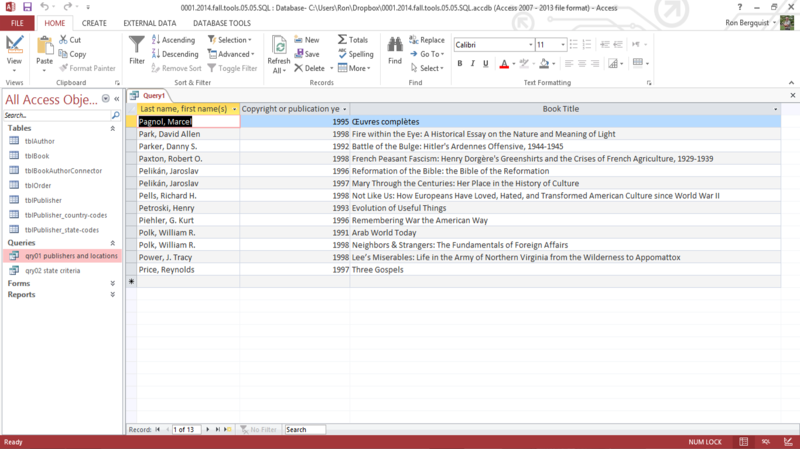 When sorting by multiple criteria, you need to arrange the sorted elements in the desired sort order, from left to right in the Query By Example grid. Here we are sorting first by publisher country, then where the country name repeats, by publisher name, then where the publisher name repeats, by state, and so forth. 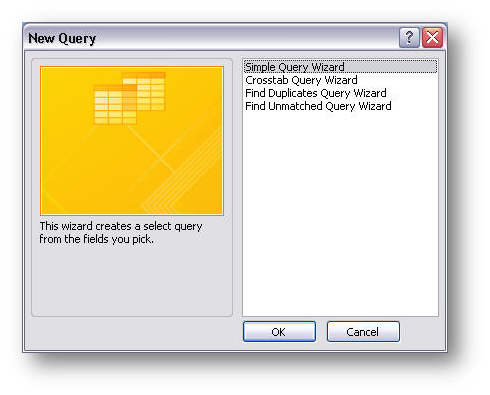 All queries are built using the Structured Query Language, or SQL, and you can review how the Wizard-built or the Design-built query is expressed in SQL. It is one of the views under the View icon in the Query Tools Design ribbon.